All cities have a haunted past. Travel the streets of Greenville South Carolina and learn about it's spooky history on our Segways. The small group will glide through Greenville while learning and exploring its haunted history. Enjoy professionally led, 90 minute tour around the city that covers roughly 3.5 miles. All Segway tours require all customer to weigh a helmet (customers are able to bring their own helmet but Greenville Glides - Greenville Segway Tours will provide all head safety gear. Once you enter our office, our friendly staff will show a short safety video about how to ride the Segway and will then assist you in sizing your helmets. Once you are 'geared' up, your tour guide will train everyone, individually, on how to ride the Segway. 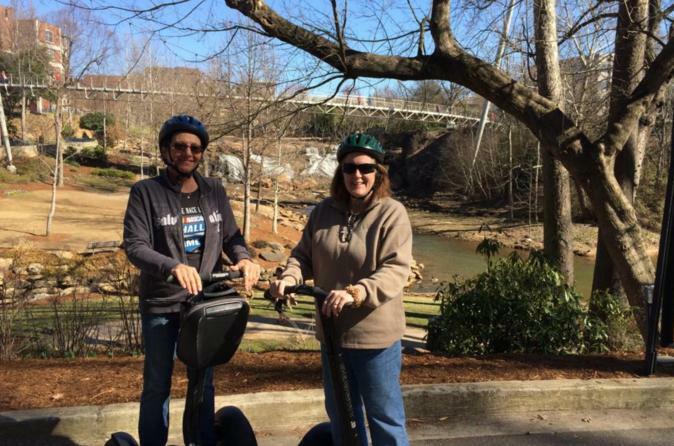 You will then be a master Segway rider and will head out into beautiful Downtown Greenville and Historic West End taking in the breathtaking views of the city. Your tour guide will lead you to all of the Haunted sites and destinations, explaining exactly what happened and why this area is haunted. Watch out! - you may see a ghost or two. Your tour guide will then allow you to take any and all pictures that you would like - If you want a group picture, ask your tour guide and he would be happy to do so. After learning about all of the Greenville ghosts, you will head back to the office where he will ask if anyone has any questions about the tour or may want to share some information.